A typical day for Gabriel Pagan might include a patrol around the school grounds, then he may have to collect a few fingerprints or brush up on New York State’s penal code. But Gabriel isn’t a police officer. At least not yet. He’s a Warwick Valley High School senior and a student in the District’s growing Career and Technical Education (CTE) program. He’s in his second year in the Criminal Justice program, where his teacher, Eduardo Avila, is a veteran of the U.S. Army’s military police force. Ultimately, Gabriel is preparing for a career in law enforcement. The Career and Technical Education work session included a tour of the new Video Production classroom. 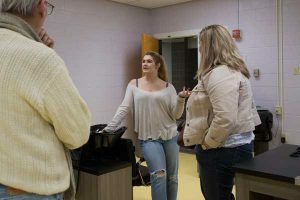 This school year, about 50 Warwick Valley juniors and seniors are on a path to graduation via the CTE Program, which was showcased recently at a Board of Education work session. 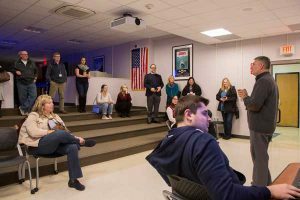 On Nov. 27, board members, administrators, and members of the public were invited for a guided tour of the program and its three CTE classrooms, where digital video cameras and manicure tools are as much a part of the students’ arsenals as pencils and textbooks. Over the past three years Warwick Valley has worked to create a CTE program which now includes Criminal Justice, and, new in the 2017-18 school year, Video Production and Cosmetology. Students previously had access to these CTE classes, Dr. Leach said, but had to travel to Orange-Ulster BOCES programs in Goshen. Dr. Leach said that when deciding which programs to offer at the high school, administrators assessed Warwick Valley students’ participation and interest in CTE, then focused on the most popular. Some programs, such as plumbing or auto repair, weren’t practical to consider based on student enrollment. But converting existing classroom space into a hair salon, a police bureau, and a video production studio was within the District’s capabilities, he said. Career and Technical Education specializes in skilled trades, technology, and career preparation, and, in years past, was called “vocational education.” Such programs offer the academic and technical skills along with the knowledge and training to launch students into careers. Disciplines such as culinary arts, engineering, fashion design, electrical and plumbing, healthcare, robotics, construction and accounting are examples of CTE programs. Warwick Valley Board of Education members visited the High School’s new Cosmetology classroom, where they had the opportunity to ask students about the CTE program. A portion of a student’s school day is spent on curriculum focused specifically on a chosen field – cosmetology students will learn about hair styling, video production students might have a lesson in interview techniques – but traditional subjects are covered as well. “The material has to support the core subject, and it has to be relevant,” said Meghan McGourty, the District’s Director of Special Education. A math lesson for Criminal Justice students, for example, may be inspired by crime statistics or speeding vehicles. Eliminating the Warwick students’ “commute” to off-site CTE classes gives them more time in their schedule for classes and activities, and enables them to participate more fully in all that WVHS offers, Ms. McGourty said. Students also spend part of their day attending their traditional academic and elective classes needed to fulfill graduation requirements. “Students graduate from our CTE Program college and career ready,” said Ms. McGourty. “Some will go directly into the workforce, but others will pursue higher education after high school.” Many Video Production students, she noted, may go on to college as they pursue careers in communications, public relations, or broadcasting. Criminal Justice students, from left to right: Alexander Avery, Gabriel Pagan, their teacher, Eduardo Avila, and Eric Warren. Nationwide, about 12.5 million high school and college students are enrolled in career and technical education, where they are prepared for the world of work. For many high school students, CTE programs provide a pathway to graduation. In fact, studies show that high school CTE programs boast a graduation rate of about 90 percent, 15 points higher than the national rate.